This game is in THE VAULT and is not available from Looney Labs at this time. Although you might still find a copy for sale at your local store or on ebay, this product is out of print here at Looney Labs and we do not have plans to reprint it at this time. A vengeful group of villagers must figure out who among them is a werewolf (before it’s too late...) Are You A Werewolf? is a deception party game for 7-15 players. Players are assigned roles secretly. Most players are Villagers, two or three will be Werewolves. The Villagers try to figure out who the werewolves are during the day, and the Werewolves eat the Villagers at night. This is a very unusual game. Each player is randomly assigned a secret identity, and then the group sits around and talks to each other trying to figure out which players are the werewolves. The villagers are trying to figure out who's a werewolf; the werewolves are pretending to be villagers, and trying to throw suspicion on real villagers. A moderator helps to keep the action going... read the Rules Sheet for more information. 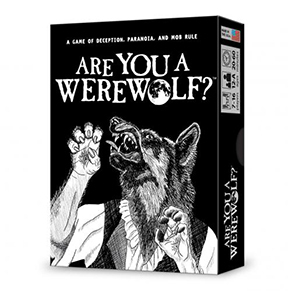 Game Review: “Are You A Werewolf” is a Howl of a Good Time! It should be noted that this game was not invented by Andrew Looney. It's based on an enduring public domain classic (more commonly known as Mafia) which is played with a standard deck of cards. It's a game the Looneys played frequently, having been taught the game by their friend Andrew Plotkin who added the Werewolf theme. We grew weary of using plain old marked up playing cards, and back in 2001 (as our Holiday Gift to our fans) created a set of more appropriately themed cards, featuring artwork by Alison. Be sure you also check out Andy's game, Are You The Traitor? Retailers: Check out how the new packaging fits into our display box! A German version of the rules is available! A Spanish version of the rules is also available!